← Waxing Theoretical Part 6: If you can’t beat ’em, join ’em! In the car today, my son asked, “how much art does an artist usually make?” We had returned less than 48 hours previously from a ten-day trip to Prague and Vienna, during which my children were exposed to more creative output than in any other ten-day period in their lives (or maybe in their lives entirely). Although often interested in attending theatre performances and occasionally music concerts, they will rarely agree to go to a museum with me when we’re home. During our ten days in Europe they (and I) voluntarily and enthusiastically overdosed on visual and decorative arts. Just before leaving, I had been reading A.S. Byatt’s excellent (although tepidly reviewed) “The Children’s Book,” which in many ways deals with similar questions about creative output. In her novel, there are several characters – the most interesting ones – who simply must create: the poor working class boy who is an extraordinary potter, the matriarchal writer of children’s stories, the puppet-maker and his sons. I don’t recall ever reading a book that so accurately depicts the artist’s need to create, to make stuff. Near the end of our trip, we visited the Leopold Museum, which was holding a special exhibit of the work of Egon Schiele. 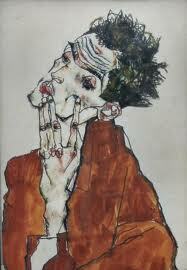 Schiele died in the flu pandemic of 1918 at the age of only 28. His work was prolific and unique. How much might he have done – how might he have changed the world – had he survived that epidemic? One of the most striking takeaways from our trip is the sheer presence of the arts in these old European cities. It seemed that everywhere we went the arts are woven into the fabric of daily life (remember that the first president of the Czech republic following communist rule was a playwright). In the US, by contrast, artists and arts organizations seem to be in a constant struggle of legitimation. Perhaps there’s a way to refocus the energy expended on that struggle toward the actual making of art. Or, perhaps, that becomes the true role of the arts administrator – to mediate on behalf of the artist in their seemingly never-ending struggle to be an artist in America. This entry was posted in Arts entrepreneurship, arts infrastructure, Uncategorized and tagged art history, art market, arts entrepreneurship, Creativity, infrastructure, visual arts. Bookmark the permalink.